Okay, so maybe the Rapture is coming tomorrow. Maybe it isn't? But no way am I going into this unprepared. 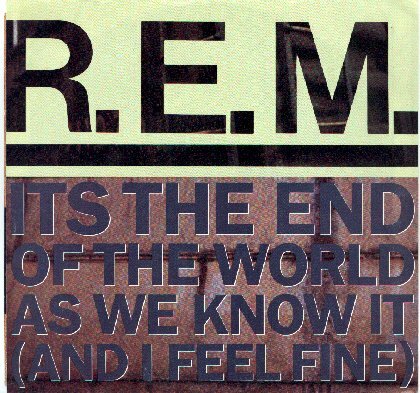 If the world ends this weekend and the Almighty's might reigns upon us -- I want to go out with the right soundtrack ringing in my ears. Don't you? So tell me -- what songs are you queuing up in your iPod when the world clocks out? The idea was simple. Invite a band to the New Haven Register, let them rip, and record every blissful note. With the help of CT Indie - we invited one of New England's best indie rock groups M.T. Bearington into the New Haven Register to play a 45 minute set last week which was free and watchable for anyone in the world with a broadband internet connection. The New Haven Register has hosted live chats with public officials and live streamed press conferences quite regularly for a while now, but we had never done any thing like this before. So we learned some very valuable lessons, and have gathered a wealth of great feedback and ideas on how to improve and further develop this new venue for local music. Not a day goes by where Register Entertainment Editor Jordan Fenster and I don't fiendishly concoct outlandish ideas to explore and experiment with. But this is the one that I've wanted to explore the most for a very, very long time. Tomorrow, The New Haven Register will play host to a live, intimate set by local indie rock vets M.T. Bearington at 6 p.m. Some fans will be in attendance to see the event for themselves (details on how to get a free invite here) while others can watch the set live and for free online (or afterwards too -- the whole set will be recorded). Please note however, the credit of this project is not mine. I just thought it would be cool. Jordan and our Community Media Lab partner CT Indie are the ones responsible for bringing this to life. We're planning for the set to go for about 45 minutes, starting at 6 p.m.
Of course, our pride in this concept does not mean it's worth doing over and over again. No bands want to perform in the middle of a forest where no one will hear them. (Except maybe that falling tree that nobody hears?) If we're going to bring bands in to play music and capture it as video content -- we need to do it because readers out there want it. So I'll report here on my blog next week the successes (and non-successes) we find from our first session. If this is the kind of thing you want to see more of from the New Haven Register, there are three things you need to do. Tell another friend, and tell them to tell a friend. I don't know about you. But when I first got word Sunday night that Barack Obama was going to deliver a rare late night address on an unknown subject -- my first thought was to get out my alien invasion survival kit. Thankfully, it was the end of something horrible (sort of); not the beginning. Many of us still tell stories about where we were when 9-11 happened. 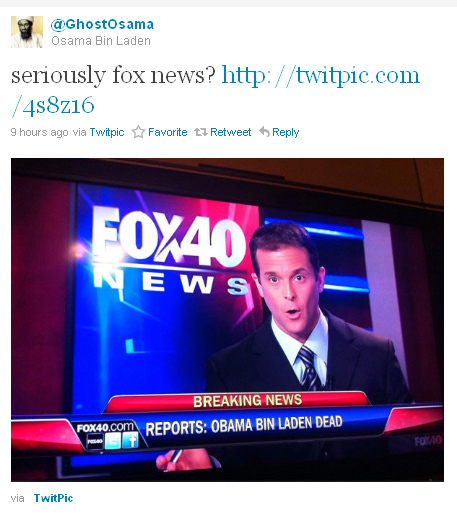 Years from now, when we talk about where we were when President Obama announced the death of Osama bin Laden -- how many of you will say you were on Twitter?